Dr. King rightfully noted how the Samaritan put the other man's needs first, something many evangelists would claim to adhere to by placing others' spiritual needs first. However, the argument loses steam when you place them inside the narrative of the parable. One could only imagine the beaten man's spirit failing upon seeing not one but two religious leaders passing by without offering help. But then, another man, dressed in a sport coat and skinny jeans, kneels beside him. The evangelist asks him if he would like to ask Jesus into his heart to be his personal savior. He takes so long praying fervently for his soul that the Samaritan mistakes his piety for compassion and continues along without stopping. Feeling satisfied that the man's future is secure, the evangelist gets up and moves on leaving his earthly shell to die. The parable might end like that today, but that's not how it ended when Jesus told it. In fact, the context of the parable indicates that if we truly cared about people, we wouldn't just care about them in the next life. Jesus told that story because an expert in the law challenged him on how a person inherited eternal life. They both agreed that loving God and loving one's neighbor were all that were necessary. 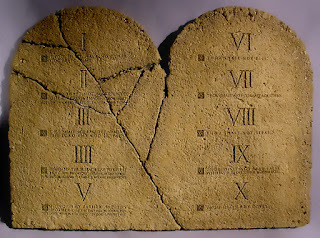 Elsewhere in Scripture, he described these as the two greatest commandments upon which hang all the law and prophets. Since loving God means keeping his commandments, it should draw pause that many of them are frequently subordinated to the urgency of the Great Commission. For example, God commanded us to promote justice multiple times in the law--in particular, with caring for the poor, needy, and oppressed. Sadly, the prophets had to call out God's people many, many times for withholding justice. We not only have records of God's commands about justice, we have detailed accounts of him correcting its failed execution. For something treated secondary if not tertiary to spreading the gospel, it's mentioned quite a bit. But the prophets didn't just call out the people for lacking justice; they criticized them for what they were doing in place of justice. Isaiah condemned their sacrifices, offerings, feasts, festivals, and prayers (all of which were prescribed in the law) because the peoples' injustices made them worthless. Even Jesus accused the Pharisees of minding the subtleties in the law rather than the overarching principles. If it disturbs you that God completely ignored their acts of worship, it should. However, Zechariah offers some insight: "Was it really for me that you fasted? And when you were eating and drinking, were you not just feasting for yourselves?" Perhaps there's more truth to Dr. King's words than he realized: "If I stop to help this man, what will happen to me?" Just as James condemned those who, in faith, encouraged the needy to "be warm and fed" without lifting a finger to help, nothing identifies the self-serving faster than lip-service. It's easy to badger your co-workers about faith or fill your timeline with John 14:6 memes and call yourself a good Christian. But it's not so easy to sacrifice your well-being for someone who may never follow Jesus. Which is funny because that's exactly what God did and exactly what he calls us to do. The Great Commission is just another worthless offering that we do in the name of our own piety. The greatest commandments, on the hand, suggest that loving God means loving others. And we cannot claim to love God if we love others merely in words and not action. We cannot claim to know true religion if we do not seek justice.